Notorious for his fiery temper, his passionate love affairs, and his severe poverty, Amedeo Modigliani was the consummate Bohemian artist in modern Paris. This portrait depicts an acquaintance from the circle of his Polish-born dealer Leopold Zborowski. The woman’s long, graceful curves and simplified features are typical of Modigliani’s approach to the human figure. During the time he resided in Paris, from the winter of 1906 until his untimely death in 1920 at the age of thirty-six, Amedeo Modigliani lived the life of the true Bohemian artist, suffering hardship to achieve ambitious artistic goals. Portrait of a Polish Woman--reflecting his interest in African sculpture, his contact with the sculptor Constantin Brancusi, and his own ventures into direct stone carving--shows Modigliani's distinctive approach to painting idealized images of feminine beauty. The portrait was painted the year before he died, when his favorite female sitters, other than his companion Jeanne Hubuterne, were drawn from the circle of his most devoted dealer, Leopold Zborowska. The sitter here has not been identified definitively but is most likely Hanka Zborowska, Leopold's aristocratic Polish wife. As is typical of Modigliani's stylized approach to his subjects, the monumental figure, composed of a series of graceful arabesques--rounded shoulders, elongated neck, and curving arms--is situated in a spare, geometric, architectural setting. Modigliani has rendered the gently tilting head, plunging neckline, and oversized collar in an elegant, modern portrait. Melissa Kerr, from Masterpieces from the Philadelphia Museum of Art: Impressionism and Modern Art (2007), p. 166. Portrait of a Polish Woman exemplifies Amedeo Modigliani's favorite choice of subject: the single figure, most often female, filling the frame, isolated from incidental detail, and directly confronting the artist and viewer. The unidentified sitter here is most likely Hanka Zborowska, the aristocratic Polish wife of Modigliani's most devoted dealer, Leopold Zborowski. Zborowska, along with her close friend Luina Czechowska, another Polish woman who might also be the subject of this portrait, both posed frequently for Modigliani in the last years of his life. The use of friends for models, a practice that began out of financial necessity, resulted in a number of penetrating encounters for Modigliani, challenging him to achieve a balance between strong individual character and the emphatic imprint of his style. In this portrait, Modigliani's propensity for fluid linearity, geometric simplification, and elongation and displacement of body parts--not unexpected for an artist sometimes described as an inheritor of the Italian Mannerist tradition--underscores the elegance and sophistication of his sitter. John B. Ravenal, from Philadelphia Museum of Art: Handbook of the Collections (1995), p. 319. In the short time he was in Paris from the winter of 1906 until his death in 1920 at the age of thirty-six, Modigliani lived as the consummate Bohemian artist, suffering hardship to achieve ambitious artistic goals. Famous for his temper, his passionate love affairs, and his severe poverty, Modigliani's life and tragic death are an extreme example of the struggle that afflicted many of the émigré artists in Paris. Arriving from his home in Livorno, Italy, he lived in Montmartre and then Montparnasse, where he excelled in painting portraits and female nudes. Stemming from an interest in African sculpture, his contact with the sculptor Constantin Brancusi, and his own ventures in direct stone carving, Modigliani fashioned a distinctive approach to painting idealized images of feminine beauty, attracting the attention of dealers by 1916. This portrait was painted one year before he died, when his favorite female sitters, other than his companion Jeanne Hebuterne, were drawn from the circle of his dealer Leopold Zborowska. Typical of Modigliani's stylized approach to his subjects, the monumental figure, composed of a series of graceful arabesques including rounded shoulders, an elongated neck, and curving arms, is situated in relation to a spare, geometric, architectural setting. The composition is sensitively designed to calibrate the signs of her individuality and personality with abstract pictorial values. Pencil drawing beneath the delicately painted surface carves through broad areas of subtly modulated, flat color to outline her almond-shaped eyes and chic coiffure. 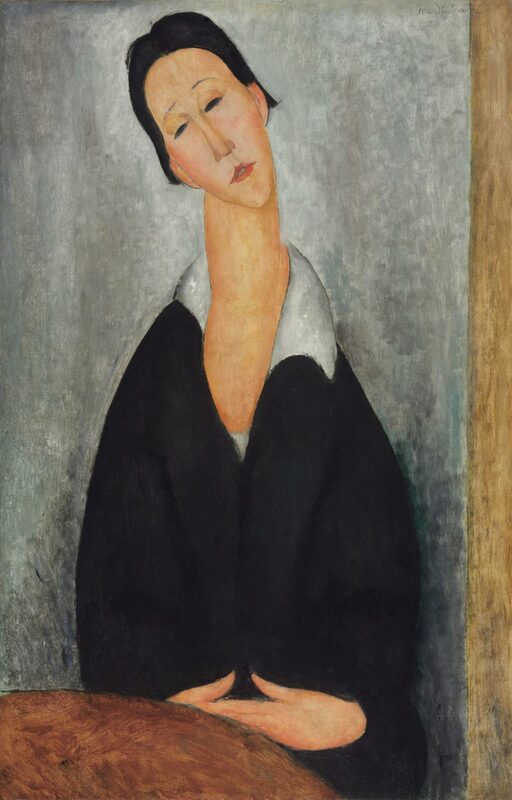 Modigliani has rendered her gently tilting head, plunging neckline, and oversized collar in an elegant, modern portrait that conveys the exotic beauty and rarified taste of his subject. Twentieth Century Painting and Sculpture in the Philadelphia Museum of Art (2000), p. 43. With Léopold Zborowski, Paris; purchased by Émile Sabouraud (1900-1996) in 1923 for his father Dr. Raymond-Jacques Sabouraud, Paris; Dr. Raymond-Jacques Sabouraud (1864-1938), Paris, until d. 1938; sold by his heirs to Jacques Dubourg (dealer), Paris, 1938 . With Sam Salz, New York, by 1947; sold to Louis E. Stern, New York, April 3, 1947 ; bequest to PMA, 1963. 1. The preceding provenance information from notes made in October 1954 by Émile Sabouraud for Louis Stern on the back of a photo of the painting (copy in curatorial file). Raymond-Jacques Sabouraud, renowned dermatologist of the Hôpital Saint-Louis, Paris, was an amateur sculptor and painter. He was a friend of Odilon Redon, who painted his portrait, and also a major art collector who owned at least nine Modiglianis (see Bénézit, Dictionnaire, 1999, "Sabouraud", and letter from Marie-Christine Decroocq, Wildenstein Institute, 9 January 2003, in curatorial file). Oddly, Émile Sabouraud's notes for Stern give his father's death date incorrectly as 1937. 2. Copy of dated receipt from Salz to Stern in curatorial file.